THE INCORPORATED TELEVISION PROGRAMME COMPANY. /PRESENTED BY OFFICIAL FILMS FOR NBC TELEVISION. Of days of old in England, when Arthur was a King. 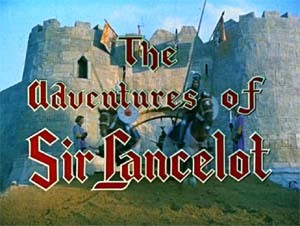 this story's told of Lancelot"
NBC aired the color episodes in color during the 1956-57 prime time run. the color episodes in B&W. prove his worth and is put through a series of rigorous tests. knight as a reward for his bravery. but is captured and thrown into the dungeon. of the Round Table, he meets with considerable opposition. by lending him Lancelots weapon and telling him it is a magic sword. A cowardly knight wants to rescue a lady who is imprisoned by her brother. weapon and telling him it is a magic sword. swears that ghosts have abducted his daughter. Marhaus and discovers and evil plot. Pre-empted: Producers' Showcase "Festival of Music"
horse is killed by a group of wild warriors. shepherd to teach them how to fight the knights off. are just waiting for them to leave so they can raid the castle. Pre-empted: Project 20 "Call to Freedom"
held prisoner. Sir Lancelot agrees to help the knight rescue the man. "squires-for-a-day" steals the Sword of Excalibur. girl, but she is not willing. Brian, are sent to destroy it. who are doing the terrorizing. who stole the precious Ruby of Radnor. Pre-empted: Producers' Showcase "Romeo and Juliet"
is selling the young men of the village of Cheddar into slavery. Producers' Showcase "The Great Sebastians"
has earned its freedom. Squire Brian warns Sir Lancelot. Marhaus, who is trying to increase his power by deceit and treachery. but apparently that is not possible. competent. Finally King Arthur sends Sir Lancelot to settle the quarrel. their host when he receives a note threatening his daughter's life. and this time it's genuine. knights object to the young contestant because of his shabby appearance. Sir Lancelot intercedes for him. fire, and during the excitement the jewel is stolen. most unusual captors - women! Note: Not listed as being broadcast in "color"
#18 "The Ruby of Radnor"
made by Lew Grade's ITC around this time.